ISLA MUJERES.- On Thursday May 10, a commercial vessel vas seized by agents of the Fifth Naval- Armed Region of Mexico for having 5 small sharks on board, since the shark catching season is closed. The vessel’s name is “La Guajira IV“, from the Cooperativa Pesquera “Patria y Progreso” of Isla Mujeres. Three fishermen were on board only known by their nicknames: Cahum, La Vaca and Venado. The three men remained on the boat for about two hours, until the fishing authorities determined that they could be released. 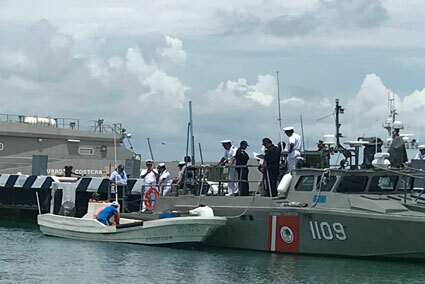 According to the president of the Cooperativa Pesquera “Patria y Progreso”, Raciel Rivero Cobá, the vessel was secured around 10 o’clock in the morning and from the point of capture “La Guajira IV” it was towed by an interceptor from the Fifth Naval Region to a pier in Isla Mujeres. He added that in spite of this evidence, the fishermen captured the sharks accidentally, since they launched a scale longline, the small sharks got hooked, and they decided not to get rid of them. On the other hand, Rivero Cobá accepted that two irregularities were detected on the vessel: Not having a certified copy of the fishing permit and not having notified the Harbor Master’s Office of the outboard motor replacement, which was previously a 90 horsepower, and was replaced with a 150 HP. Finally, the boat was released along with its three crew members, although now the management of the fishing cooperative must resolve the observations before the port authority.